Roland Brewsaugh Owl WELBY wall clock, Novelty collectible. Retro Style Geneva Clock Company round wall clock in red plastic frame. WESCO MOE's Tavern Homer Simpson wall or standing clock, It's Duff Time from 2003. LIONEL Train Station Anniversary wall clock by EMSON. Burnwood Products plastic man's tools wall clock, working condition. Burnwood Products plastic chef's wall clock in working condition. 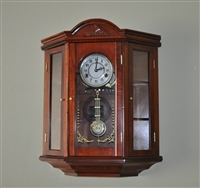 Curio wind up 31 day vintage clock with chime.